FINI SCAD bass player LINCOLN BEECROFT believes the best state to be in when listening to his band's long-playing album WIDESCREEN is drunk. After all, two of the tracks were recorded while the band was intoxicated, perhaps by the sweet melodies and utter power of the sound. Playing at the Northern Star hotel tomorrow night, FINI SCAD has produced an album that has all the same hallmarks of greatness as the bands which have inspired them. 'We did two months in New York with (producer) JOHN AGNELLO (DINOSAUR JR, BUFFALO TOM and RED KROSS),' he said. WIDESCREEN, released last month, is a sonic assault that is dense with urgency, passion and pop. It's a ball of noise that just keeps rumbling along. Beecroft says it came as a surprise to many people that the band was a lot more raucous than the sweet sounding pop of COPPERTONE only hints at in the chorus. 'A lot of people came along to our shows and expected a sort of quiet night with your beer, foot tapping along, but instead we'd be up there smashing away and screaming and stuff,' he said. 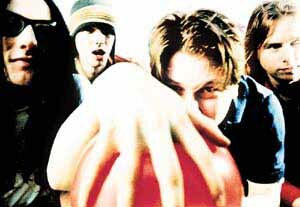 In 1995 the band recorded COPPERTONE, which was so successful it earned itself a number 42 spot on the TRIPLE J HOTTEST 100. It was the same year that singer guitarist DAVE THOMAS relocated from Brisbane to Sydney wanting a change. Something new and fresh. Linking up with Beecroft, guitarist BILL COUPLAND, and drummer JONO MCPHEE the band clicked instantly. Coppertone was conceived at the first full band practice. 'We thought Hey there must be some chemistry here",' Thomas said.